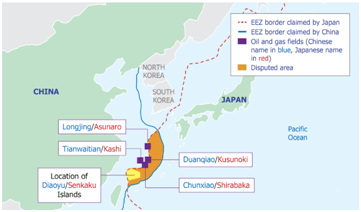 The East China Sea dispute is the dispute regarding the overlapping EEZ claims of Japan and China. Both China and Japan claim sovereignty over a small group of uninhabited islands in the East China Sea, called the Senkaku by the Japanese and the Diaoyu by the Chinese. The dispute arises due to the different implementation of UNCLOS (United Nations Convention of Law of Sea), which both nations have ratified. Under the United Nations’ Law of the Sea, the PRC claims the disputed ocean territory as its own Exclusive Economic Zone (EEZ) due to its being part of PRC’s natural extension of its continental shelf, while Japan claims the disputed ocean territory as its own EEZ because it is within 200 nautical miles (370 km) from Japan’s coast, and proposed a median line as the boundary between the EEZ of China and Japan. About 40,000 square kilometers of EEZ are in dispute. China and Japan both claim 200 nautical miles EEZ rights, but the East China Sea width is only 360 nautical miles. China claims an EEZ extending to the eastern end of the Chinese continental shelf (based on UNCLOS III) which goes deep into the Japanese’s claimed EEZ. The disputed islands were once controlled by the United States as part of its post–World War II occupation of Japan and only returned to Japanese administrative control with the reversion of Okinawa in 1971. As Washington prepared to return these islands to Japan, the People’s Republic of China (PRC) and Taiwan contested Japan’s sovereignty. Two years earlier, a United Nations (UN) geological survey of the East China Sea revealed the potential significant hydrocarbon resources, which further upped the ante. The dispute has over the years evolved into one of the most significant bi-party international clash. The recent unilateral declared of ADIZ (Air Defense Identification Zone) by China covering the international airspace over parts of the disputed East China Sea, requiring all non-commercial aircraft to notify its authorities of their flight plans to avoid triggering a response from air defense forces is expected to further trigger the tensions with Japan. The latest move represents a significant ratcheting-up of China’s challenge to Japanese control of the Senkakus. The new zone increases the risk of military escalation, accidental or otherwise. The Japanese government has refused to accept China’s new ADIZ. Prime Minister Abe said this will “not have any effect on Japan.” Beijing’s ADIZ announcement places Japan in a difficult spot. 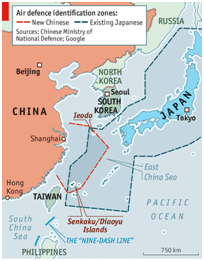 From Tokyo, the ADIZ looks like an effort to undermine Japan’s administrative control over the Senkaku Islands. These developments have had a detrimental effect on the improving Sino-Japanese relationships and has further led to increased tensions in the East Asia region. India had already got a taste of the Chinese unpredictable behavior earlier this year when Chinese troops had come deep inside the Indian Territory weeks. It took three weeks for the explosive situation to resolve. The Chinese withdrew their troops and the two sides finally ended up signing a border defense cooperation agreement during Indian prime minister’s visit to Beijing. The poser for India is how would deal with the situation if the Chinese declared an ADIZ somewhere along the disputed border? Indian policy makers must be mulling over this eventuality.